I have a fear of parking. Or rather, I have a fear of a lack of parking. Last year, when I knew I’d be one of thousands of tourists converging on Gettysburg National Military Park for the 150th anniversary of Pickett’s Charge, I left the house at 3:30 am for the two hour drive. You laugh, but I had my choice of parking spaces at 5:30. And mine was not the first car there. So after Hillwood Estate, Museum and Gardens sent out a message warning of a dearth of parking for their annual French Festival, I was there at 9:30 for a 10:00 opening. I thought I might have to wait on the street, but the gates were open and the guard waved us in. I had no problem getting a prime parking space. (When we left mid-afternoon, on the other hand, there were cars parked along every inch of the roads inside the estate, and a line of cars waiting to get onto the property.) Museum staff met us at the door of the visitor center, checked us off on their registration list and, even though it was 30 minutes before the scheduled start of their day, we were in. I’m a little OCD about planning and organization and so, it seemed, were they. 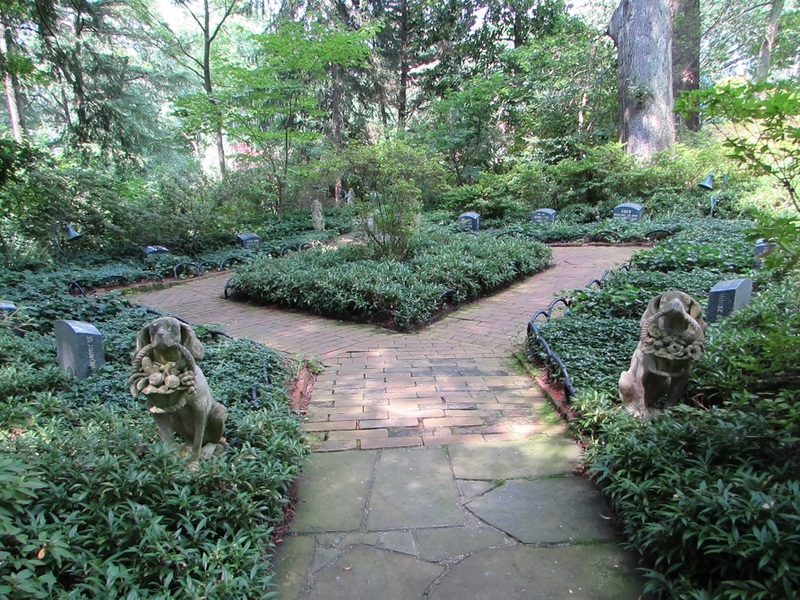 Hillwood, bordering Rock Creek Park in northwest DC, once belonged to Marjorie Merriweather Post, of the cereal family. The museum consists of Russian and French decorative art collected by Post and housed in her 1920s Georgian revival mansion. 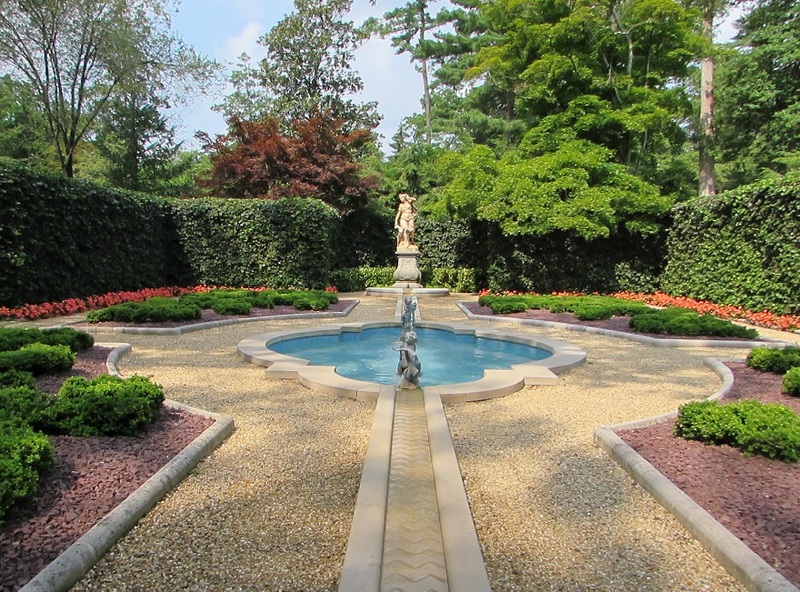 The gardens are the 25 acres — over half formally landscaped — that flow from the house to beyond. 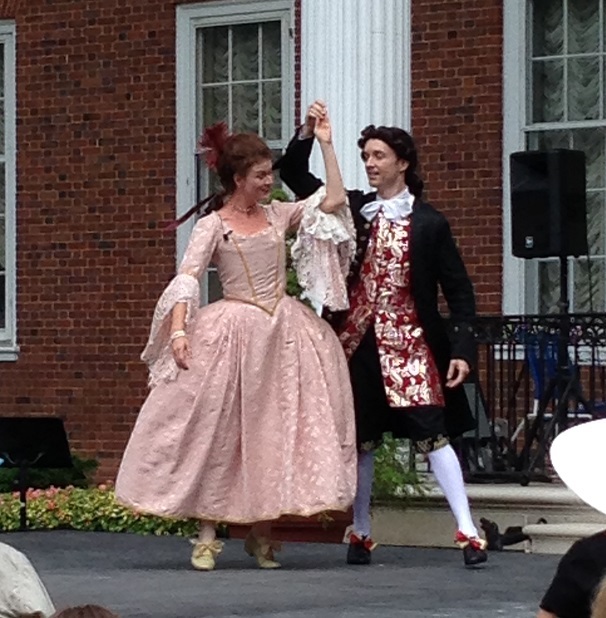 The festival featured 18th century French themed special programs all around the property. I went with a couple of friends and we started at the Dacha, a small, rustic, Russian-themed dependency. On that day, the Dacha was the setting for a children’s craft activity: making 18th century style shoes with decorative paper, plastic gems, ribbon and lace. A friend of one in our group works at Hillwood and was scheduled to be stationed there. She wasn’t there, but the place was almost empty, so we stayed and made shoes anyway. Jimmy Choo has nothing to fear from us. After the disappointment of learning that we wouldn’t be quitting our day jobs to make our millions in the shoe business, we headed to the gardens for a contemplative wander. The first place we came across was the sweetest little pet cemetery. Marjorie Post loved her animals. If I were forced to choose seeing only the house or only the gardens, I might have to choose the gardens. They are that spectacular. The visitor center, house and other estate buildings are filled with the most amazing arrangements, from the cutting garden (you’ll see one in the photo of the dining room in the next post). 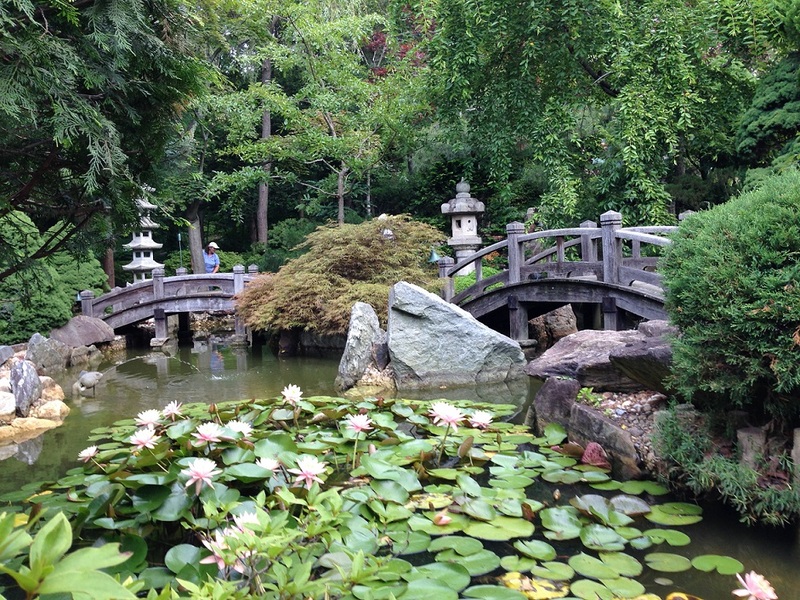 My favorite part of the garden was a Japanese style area that rolled down the side of a hill. It took us a couple of hours to do the gardens and watch some of the outdoor performances. Hunger hit around noon and we had a lovely lunch in their lovely cafe — huge sandwiches and salads will feed more than one. Next time, we’ll know to share. We also could have brought a picnic and spread out on their lawn. They even supplied blanket to sit on. I’ll be back in December for their Russian festival. Mr. History Tourist wants to go to that one, because he wants to see Hillwood’s Faberge eggs. You’ll get to see one in the next post, which will be about the house. 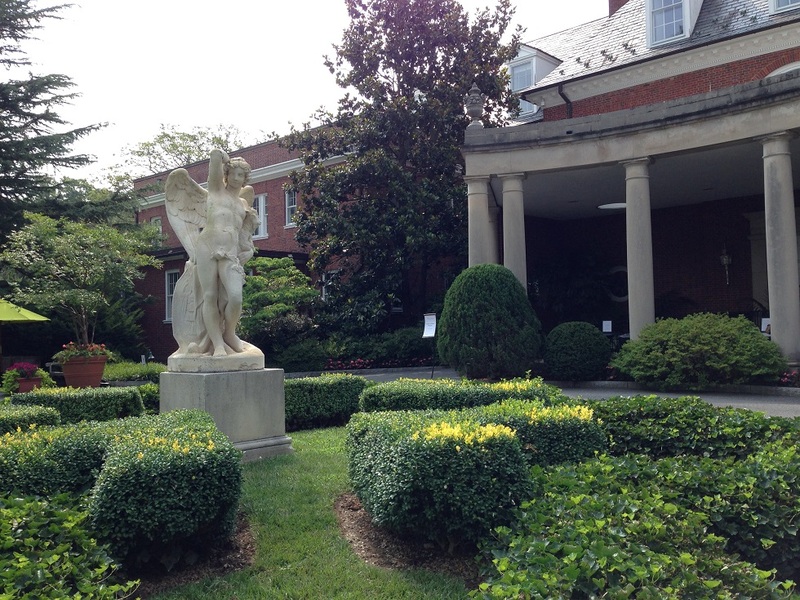 Gallery | This entry was posted in Washington DC and tagged Hillwood French Festival, Marjorie Merriweather Post. Bookmark the permalink. This is one of my favorite spots in DC!! It’s beautiful in the later fall, around Veterans Day weekend. Last year the leaves were that perfect red-orange hue, and contrasted so nicely with the brith blue of the fountain in the gravel garden area. Did you explore the greenhouses? I did explore the greenhouses. There were orchids in bloom. Thanks for the info about Hillwood in the fall. I’ll definitely have to check that out. Well done getting that parking spot. Well worth the effort looking at those pictures of the gardens. I really think those gardens probably are the nicest I’ve ever seen anywhere. Or at least, within memory. Those shoes have been burned (although a friend did take a photo of them, to use for blackmail should she ever need to). The 6-year-olds next to us were designing fabulous creations and ours were just…sad. Brilliant to get there early and avoid the hassle. I have a morbid fear of standing in line, I just hate it. Would never survive in the city. 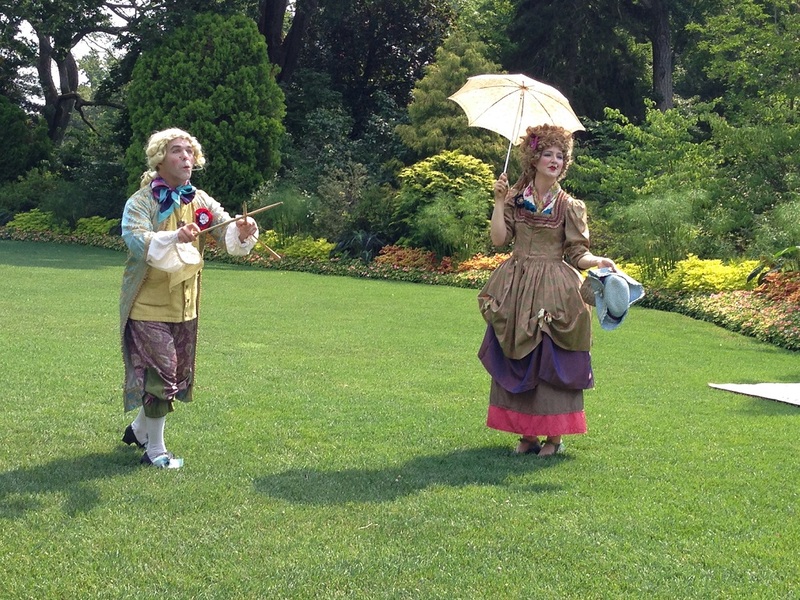 Absolutely gorgeous gardens, and Bravo to anyone brave enough to do the full 18th century French makeup as well as clothing. I love the 18th century clothing styles, and most of the more casual hairstyles, but the accurate make up is startlingly freakish. Lovely photographs of the gardens. Thank you. Thanks. They were so gorgeous, it really would have been hard to take a bad photo of them. We keep saying that we’ll bury Ralph at his favorite place in a park (we have his ashes), but we don’t seem to be willing to do anything about. I will wait patiently for the Pippablog update. The pics on Rough Seas will hold me for now.